A printed or digital copy of “War News”. 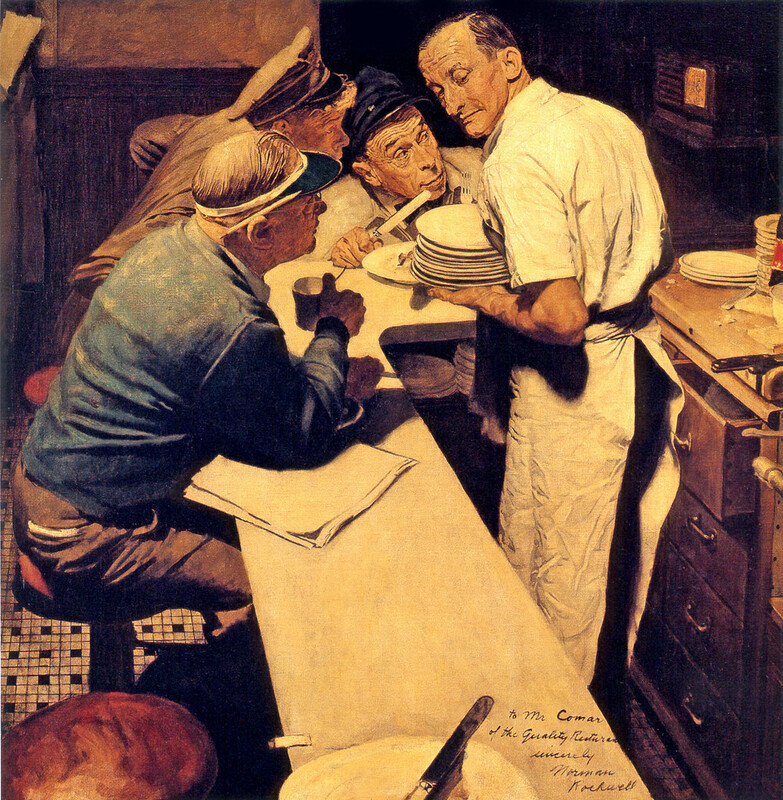 War News, Norman Rockwell. 1945. What do you notice about this painting? What is the setting? What are the characters wearing? What are they doing? What objects do you notice? What do these details tell you about when this painting may have been created? If necessary, draw children’s attention to the radio. Ask, do we still listen to radios like this? Why not? Why is the radio there? How is it being used? Reveal when this painting was created (1944) make a list of all the things students know about this year or time. If students are not studying this time frame, work together to do some research. Based on what students now know, say, the characters in this scene are listening to a news report. What do you think the news report is about? Now draw their attention to the blank newspaper if they have not already noticed it. Explain that Rockwell did not have a chance to finish the illustration but had intended to put a headline on the paper. Ask, “Based on what you know, what might the headline have been. Encourage students to create their own historically relevant headlines. Have students share their headlines and then reveal the headline that Rockwell was intending to include. Have students write news articles that may have been included in paper that sits on the counter. Have them do research on the events leading up to Normandy and then choose one to write a news article about. You may even give them some article from the same time period and ask them to emulate the style and tone. Break students into small groups and ask them to “fact check” each other’s articles.